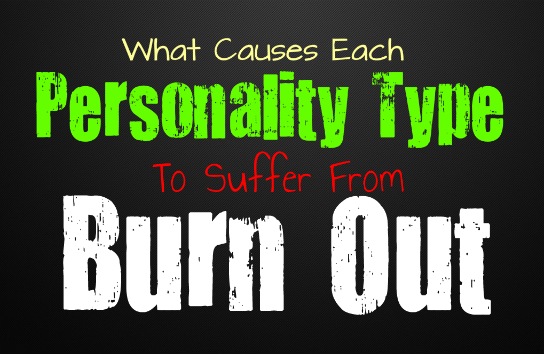 Any personality type can suffer from a state of burnout, and this is often caused by long period of stress. Burnout causes the sufferer to be completely emotionally, mentally and spiritually worn out. They might feel so overwhelmed that they cannot function like they normally do. They will appear extremely different from their normal selves, and might find it hard to be around others. INFJs often become burnt out, after they have neglected their own needs for a prolonged amount of time. INFJs care very much about the feelings of others, which can lead them to forget their own desires and needs. An INFJ who is in love, may even find themselves forced to interact with others for far longer than is healthy for them. They require plenty of alone time in order to process their thoughts and emotions- without this alone time the INFJ will become extremely exhausted both mentally and physically. INFJs also become overwhelmed if they feel like they aren’t living up to their own expectations, and are somehow failing to accomplish their purpose. The INFJ who is suffering from burn out, if often very different from their normal selves. They are anxious, and might even be pushy towards those around them. They may become self-destructive, and self-flagellating during this time. The INFJ will be much more reckless, and won’t be as compassionate as they normally are. This can be a difficult time for the INFJ, and what they truly need is to retreat inward for a while. The INFJ needs to recharge their batteries, and spend some time tending to their own needs in order to mend. ENFJs suffer from burn out, when they neglect their own needs in order to tend to the needs of others. If the ENFJ goes too long without having any help or appreciation from those around them, the will become overwhelmed and completely exhausted. ENFJs are mainly focused on taking care of their loved ones, and will do anything to make them happy. They are extremely people focused, and because of this they will likely ignore their own emotions for a long period of time. This will ultimately cause the ENFJ to burn out, and become exhausted and overwhelmed. They try to handle far too many tasks all by themselves, and eventually this becomes hard to handle. The ENFJ will become less capable of being around others, and might lose their compassionate nature. They will be much less considerate, and might even snap at the people they love. This is extremely hard for the ENFJ to endure, and they often need their loved ones to comfort them and show them just how much they appreciate their efforts. They also need time to rest and take care of their own needs and desires in order to get back to normal. If an INFP is forced to socialize for long periods of time, they will quickly burn out. INFPs also become overwhelmed if they forced to comply with authority figures, or the expectations of those around them. Being forced to behave like everyone else, can become extremely exhausting for an INFP. They need space to be themselves, without feeling an intense amount of pressure from others. In some cases an INFP can be in work situations where they need to comply with the demands of their boss, and even be in social settings often. This will quickly cause the INFP to feel overwhelmed, and like they are about to crack. The INFP who is burnt out, is extremely on edge, and might find themselves snapping at people. They normally are good at keeping their composure and their emotions in check, but not during this time. The INFP will become short tempered and might even provoke fights. If they are incapable of removing themselves from the difficult situations, the INFP needs to make time for themselves when they can. Revert to things that comfort them and ease their minds- this is necessary in order to men their souls. If it is possible, a small vacation might be in order. ENFPs have a tendency to overexert themselves, especially in their work life. They will push very hard and give more than 100%, but it will lead them to become overwhelmed. ENFPs go hard on just about everything they do, and don’t really like doing anything with partial effort. They put their hearts into everything- but this can cause them to burn out and become overwhelmed. They often begin a job, school, or hobby with excitement and energy- which causes them to do very well for a while. But then the ENFP becomes exhausted with this, and finds themselves feeling like they cannot go on like they have been. When this happens, the ENFP will often require a lot of relaxation time, but this can be misunderstood by others. They simply need to find a way to continue their required paths, without exhausting themselves. Taking enough time to relax and do the things they enjoy, without pushing too hard- is extremely necessary for the ENFP. INTJs often experience a burn out, when they have gone too long expecting far too much from themselves. They often hold themselves to extremely high standards, but this is something that cannot be lived up to completely. INTJs are great at accomplishing their goals, but will never truly feel like they have grown enough, or become successful enough. They want to learn as much as they can about pretty much everything- which is a rather grand goal. When the INTJ has gone too long with these rather overwhelming expectations, they may experience a sense of apathy. Instead of their normally driven and clever selves, the INTJ will become self-indulgent and avoidant. They won’t be focused on getting things done, and might become self-destructive. The INTJ simply needs to take a look at their accomplishments, and realize that they have actually succeeded in a lot. They are smart enough to realize that no one can be perfect, so why should they expect this from themselves? ENTJs often push themselves extremely hard in order to be successful. They are driven individuals, and are excellent at leading others forward. This drive however, can become rather exhausting for the ENTJ if it is not kept in check for far too long. The ENTJ will become burnt out, especially if they haven’t taken time to relax and enjoy some downtime. They might feel like all of their hard work is going to waste, especially if they aren’t yielding rewards as quickly as they would hope. The ENTJ during their burn out, is likely to be far more emotional than usual. They might become obsessed with making moral decisions, and will find themselves expressing their upset much more readily than usual. The ENTJ simply needs to take some time for themselves, in order to relax and recharge. They need to accept the things that they cannot change, and let go of the stress they are holding onto. INTPs often experience feelings of burn out, when they have been forced into social situations for too long. INTPs set rather high expectations for themselves, and become even more overwhelmed if they feel like other people are holding expectations for them. Being pressured to succeed can be exhausting for an INTP. They need their own space and time to figure things, and will become unbelievably exhausted if someone pushes them to fulfill their own personal desires. INTPs during their burn out will appear more emotional, and focused how others are perceiving them. They will be reactive, and might even snap at people they would never want to hurt. This is rather difficult for the INTP, since they are usually logical and analytical people. What they truly need, is plenty of time on their own, without feeling pressure from their loved ones or friends. The INTP needs to focus on themselves, and figure out what it is that has brought them to this place of stress. ENTPs often find themselves interested in many different things, but sometimes this can actually overwhelm them. They have a fear of missing out, which can cause them to never truly stick to one project or hobby. ENTPs need to be able to focus on something they enjoy eventually, or they will likely become exhausted by this constant need to keep moving. Constantly bouncing around, might end up causing the ENTP to remain stagnant and unable to move forward. The normally enthusiastic ENTP will become disinterested, and inactive. In order to pull out of this state, they need to push themselves to focus on one of their passions. Just pushing through the stagnancy and forcing themselves to stick with something, can often help the ENTP see the benefits of such a decision. Sometimes shaking up their surroundings is great too, and if the ENTP is in too deep of a rut, making a move to a different city might change their perspective. ISTJs are constantly focused on getting things done, and will never sit back when there is work to be finished. This constant drive to work hard, can actually cause the ISTJ to become exhausted and overwhelmed. If they feel like their efforts are not being noticed, or appreciated- the ISTJ will start to burn out. They need to have feedback, whether that is negative or positive. Not seeing a clear way to fix their errors, is going to become extremely exhausting for an ISTJ. An ISTJ who is overwhelmed, will become drained and short tempered. They may attempt to try new things, in hopes of finding a solution. After that thought, the ISTJ becomes incapable of finding a way out of their situation. They simply need to take a step back, and analyze their situation. If the ISTJ is in a situation where their efforts are not appreciated, they might need to find more reasonable surroundings. ESTJs will go a rather long time without stopping to take breaks, and because of this they often suffer from burn out. ESTJs are hardworking, and often take on many different tasks. If the ESTJ feels like they aren’t capable of getting things done fast enough, they will find themselves overwhelmed rather quickly. An ESTJ who is suffering from burn out, won’t be as focused and driven as they usually are. They might find themselves completely stagnant and in incapable of moving forward. This is very difficult for ESTJ, especially as they watch their tasks piling up around them. The ESTJ might need to ask for help when this occurs, which is actually very difficult for them to do. If their loved ones can find the time to take care of some of the things the ESTJ needs to get done, it will really help them relax and get back to themselves. ISFJs are naturally focused on the needs of their loved ones. They prefer following a schedule and might become frustrated if this schedule is disrupted. ISFJs can suffer from burn out, if they are forced to be social for prolonged periods of time, without much rest or alone time. ISFJs desire to care for their loved ones can cause them to neglect their own needs- but this can become very harmful for the ISFJs mental health. When the ISFJ is suffering from burn out, they might find themselves incapable of tending to the normal daily tasks that usually come so easy. The ISFJ won’t be as focused on taking care of their loved ones, since they are far too exhausted to do so. What the ISFJ needs is to focus on their schedule, and stop allow others to force them to try new things or explore new ideas. The ISFJ needs to take time for themselves, in order to get back to health state of mind. ESFJs are extremely focused on fulfilling the needs of their loved ones. Their constant need to care for the emotions of other people, can cause the ESFJ to neglect their own needs and desires. After too long of neglecting themselves, the ESFJ will suffer from an immensely overwhelming burn out. They will find themselves incapable of getting anything done, and might begin analyzing their situation. The normally warm and giving ESFJ, will struggle to get through their normal schedule. They won’t be able to fulfill the needs of their loved ones, which will become even more upsetting for them. They might start snapping at those around them, and won’t take as much notice to the emotions of others. The ESFJ simply needs to take some time for themselves, in order to recuperate. They do best if their loved ones can help to take care of the ESFJ, and push them to take this time for their own needs. ISTPs enjoy plenty of alone time, and simply want to be left to do their own thing. If the ISTP is forced to entertain people, or spend too much time in social situations, they will become overwhelmed. ISTPs will especially become exhausted if they feel a constant pressure to perform or follow the rules of other people. If they are in a situation where the ISTP cannot break or bend the rules, it will actually become a struggle for them. ISTPs need to be allowed to spend time by themselves, and often become exhausted by social situations. When they are suffering from a burn out, they need to take some time to regroup. Their loved ones also need to allow this to happen- so that the ISTP can analyze what went wrong to get them to this stressful point. ESTPs often push themselves very hard, especially when they have an important goal in mind. They may take on too many tasks, in an effort to get things done faster. ESTPs are seen as adventurous and fun people- but they are also driven and goal oriented. If the ESTP is attempting to juggle their work and social life, they might discover that it all becomes a bit too much to handle. The ESTP who is burnt out, will not be their usual fun-loving self. They might attempt to follow a fixed schedule for a while, in order to mend things. This ultimately will push the ESTP into their burn out, and they will be seen as stagnant and incapable of getting things done. Certain tasks might fall behind in the ESTPs life, and they will find it hard to push forward. The ESTP needs to let go of the pressure they are placing on themselves, and find a way to accept their situation. They will likely get through much better than they expect, so stressing is only going to make things worse for them than it truly needs to be. ISFPs are introverted and dreamy people- who enjoy connecting with their passionate side. If the ISFP is forced into a situation where they feel like they are making immoral decisions, they will quickly become overwhelmed. If the ISFP is surrounded by people who they believe do not care about the feelings of others- it will become quickly upsetting for them. ISFPs need to be around people who have a strong moral backbone- similar to the ISFP. They are perfectly accepting of people who have different opinions- as long as those people are following a path of morality. ISFPs who are suffering from burn out, will be harsh and possible pushy. They might find themselves trying to force certain people to follow a better path, but this will likely not be successful. They might find themselves snapping at people around them, which is entirely unlike the ISFP. In order to heal and get back to themselves, the ISFP needs to take time for themselves without the presence of others. ESFPs are extremely fun and entertaining people- who enjoy living life to the fullest. They are passionate individuals, often seen making others laugh. If the ESFP feels like their loved ones are neglecting them, or aren’t considerate enough of their needs- the ESFP will become overwhelmed. If they are constantly forced to take care of the household tasks- without being able to take a break for themselves- the ESFP will definitely suffer from a burn out. ESFPs needs to be able to enjoy life, and if they are forced to perform monotonous tasks it will be too much for them after a while. ESFPs who are suffering from burn out, simply need to spend time with their loved ones. They need to feel like they are being appreciated and loved by those closest to them.